The runways in Paris are open for business again. The original fashion week, Paris still reigns as the crown jewel of the season, and for good reason: The City of Lights is the home of couture, the place where Charles Frederick Worth invented the fashion show, back in 1858, and the city where the most storied fashion houses debut their wares. Simply put, there is an unparalleled legacy of fashion craft, fashion spectacle and fashion glamour there. The first few ready-to-wear fashion shows were staged in Paris in 1973. Indeed, the event was launched as a showcase for the still-nascent business in ready-to-wear, or pret a porter; through the late 1950s, couture had been shown in small presentations at designers’ ateliers, while buyers commissioned anonymous teams of designers to create clothes that could be sold off-the-peg at department stores. These goods weren’t considered “fashion,” as such. But Valentino had anticipated the growth of the ready-to-wear business, opening shops for his ready-made clothes in New York, Geneva, Lausanne, London, and in Paris itself. And forty years ago this year, he staged his first ready-to-wear show in Paris: In 1975, as Bernardine Morris wrote in her book Valentino: Fashion Memoir, Maison Valentino became one of the first houses to show ready-to-wear at Paris Fashion Week, and ever since, the Valentino shows have been one of the week’s flagship events. “For the first time Paris took an Italian designer to its heart, with a kind of standing ovation usually reserved for the members of its own exclusive club,” Hebe Dorsey wrote in The International Herald Tribune. No wonder, then, that when Milan launched its own fashion week in 1979, that Mr. Valentino and Mr. Giammetti decided to continue showing in Paris, rather than their native Italy. The popularity and influence of the Valentino ready-to-wear had elevated the house beyond any national identity: It had emerged as one of the first truly international luxury brands. 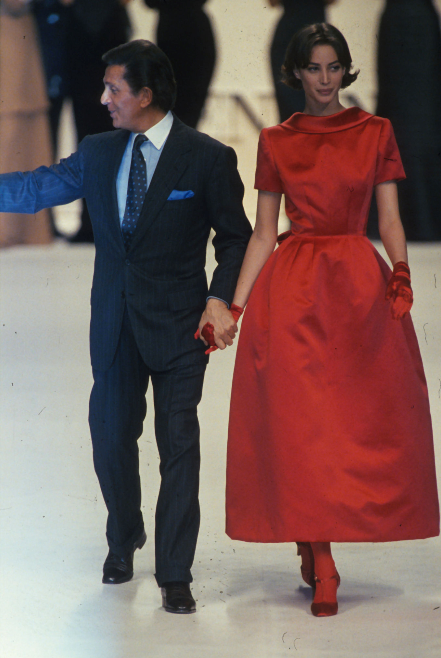 In the 1980s, Diana Vreeland invited Mr. Valentino to show his collection at a special event at the Metropolitan Museum in New York; he was also invited to show in Tokyo, at an event celebrating “the five best designers in the world.” Today, the Valentino name is known everywhere. There are more than 100 Valentino stores worldwide—seven in Paris alone. That presence is fitting, given that Maison Valentino helped to make Paris Fashion Week—and the ready-to-wear business, more generally—what it is today.